The Jet Set Girls Weekender Kit from 3 FLOZ - The stale, dry air in airplanes can do quite the number on your epidermis and once-bouncy tresses ....but this kit will keep your skin, hair, face and nails looking hydrated and gorge! Remix Blanket by Ferm Living* - A gorgeous jacquard knit blanket in squares print. Perfect to cuddle up with on that awful red-eye flight, for an impromptu picnic at your beach destination, or staying warm after a day of skiing in the Alps. Calling Cards by The Butter NYC - Keep in touch with your international contacts with these chic calling cards...the days of scribbling your info on a napkin are dunzo. Voluspa Candle in Macaron* - With the sweet scent of Macarons de Paris, you will want to eat this right up...even if you just were in Paris gobbling up the real deal! Marie Antoinette would be so proud. Tocca Rollerball Trio* - The house of Tocca calls to mind chic European style and old-world places. The perfect introduction to their fragrances, this set includes three distinctive scents in a take-anywhere rollerball. Jetsetter - 1. TSA - 0. Goorin Brothers Wilma Fedora* - Deflated, static and stringy hair is not cute. Cover up strands in need of some TLC after a long flight with a cool black topper. iTunes giftcard with playlist suggestions - With all that spare time to listen to tunes, the jetsetter's playlist is constantly on rotation to keep it from getting stale. Give them the gift of calming tunes or rump-shaking beats with an iTunes giftcard paired with the free printable playlist I made specially for you. Dolce Vita Nariko Embossed Flats* - These snake-embossed leather flats are the perfect slip on, slip off shoe for that awful and traumatic time when we are forced to take off our shoes for airport security. Anyone else absolutely cringe when that time comes? I curse the fool who attempted to terrorize the nation with a bomb in his shoe! Classic Globe - Naturally, a jetsetter needs to figure out her next destination. Give this cool, modern globe (with Scandinavian style, no less!) a swirl and use your finger to stop it's rotation. Buy a ticket to the first place your finger lands. How adventurous. Paris + From Stripes to Chevrons Personalized Stationary - Bonjour! These classic personalized stationery cards are an elegant way to let your loved ones know you miss them terribly and are having a fantastic time during your travels. Juicy Couture Earbuds in Case* - These gold-plated earbuds in a glitter-covered case are a surefire way to listen to your tuneskis in the highest (and most compact) style yet. Michael Kors Runway Time Teller Watch* - Keep track of all those flight times and international time zones with this rose gold-plated watch. It's also available in an equally cool rose gold and white combo! 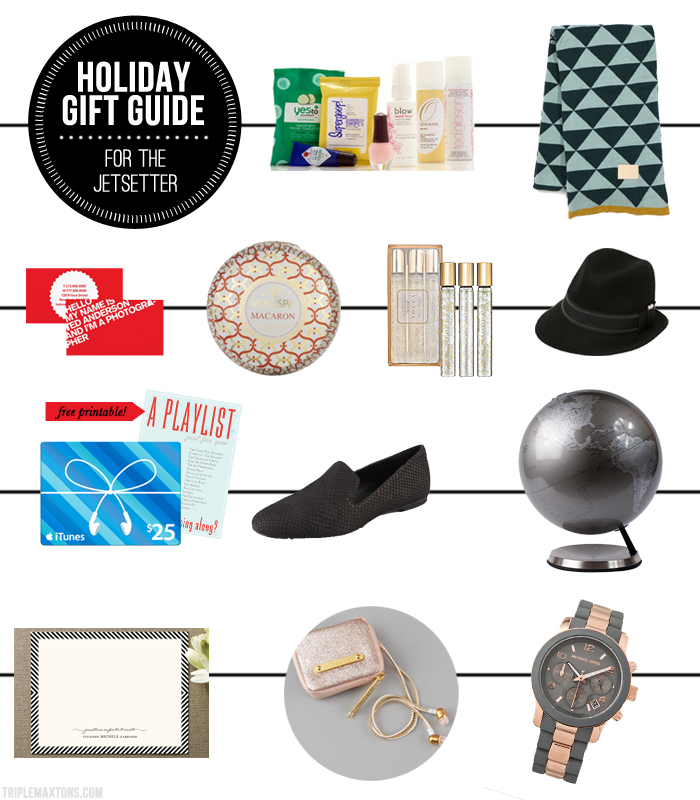 These are such amazing gift ideas, especially the Michael Kors watch.